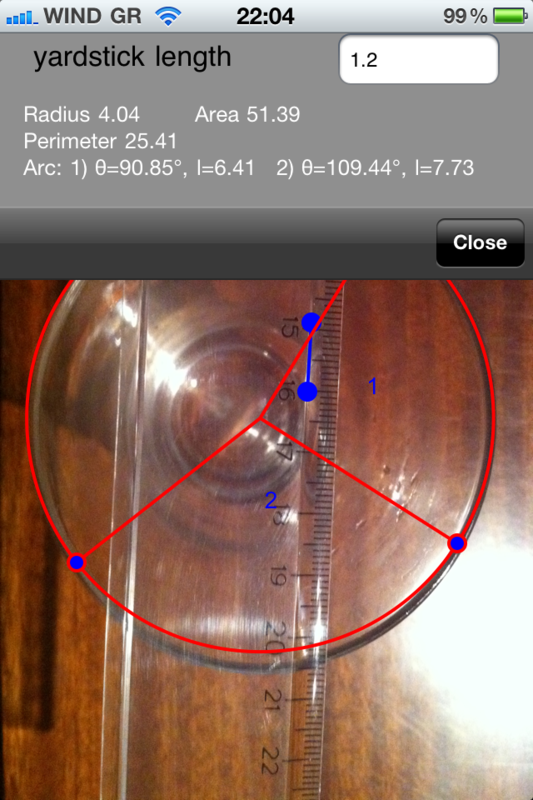 The application is equipped with a new tool that allows one to calculate the perimeter and the area of a circle. This tool costs $0.99 or 0.79€, and the user would have to purchase it by clicking on the "AddOn" button. This button is located in the top left corner. As this "in-app purchase" was also submitted to Apple for review, you may get an error message when you click on this button. This is not a permanent error, and it will go away when Apple approves the "in-app purchase". 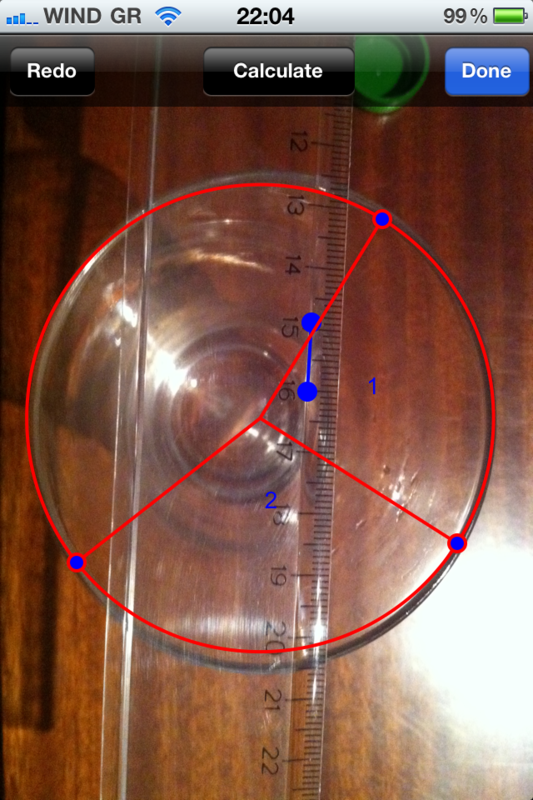 By using the new tool of the application we calculated the perimeter and the area of a glass. The accuracy is very good, as the radius of the glass is slightly larger thatn 4. It is very easy to use this new tool. Initially, we need to pinpoint two points to indicate the length of the yardstick (the points in blue colour), and then we pinpoint 3 more points. These points would lie on the circumference of a circle. Once we give the length of the yardstick, iPinpoint will calculate the radius of the circle, and report its perimeter and its area. It will also give the magnitude of the angles (and their arc length) that is formed from these three points. 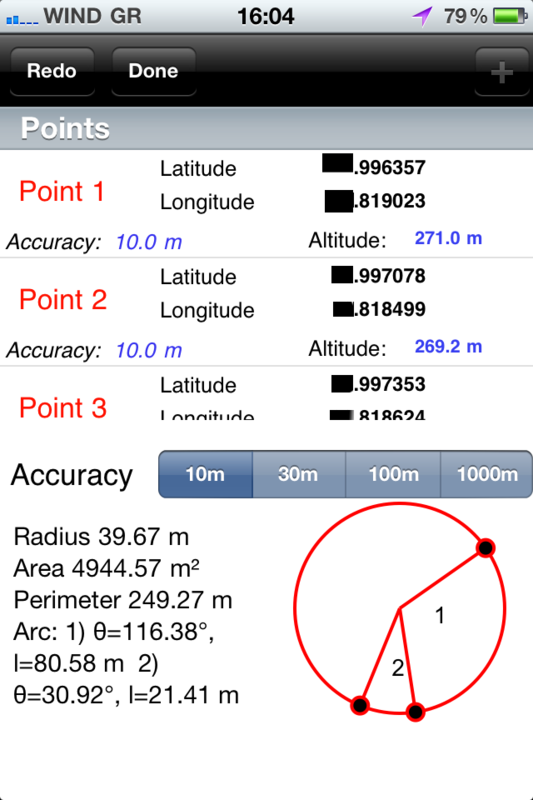 As it is expected, this tool also works for the case where the GPS device was used to obtain the location of the points.